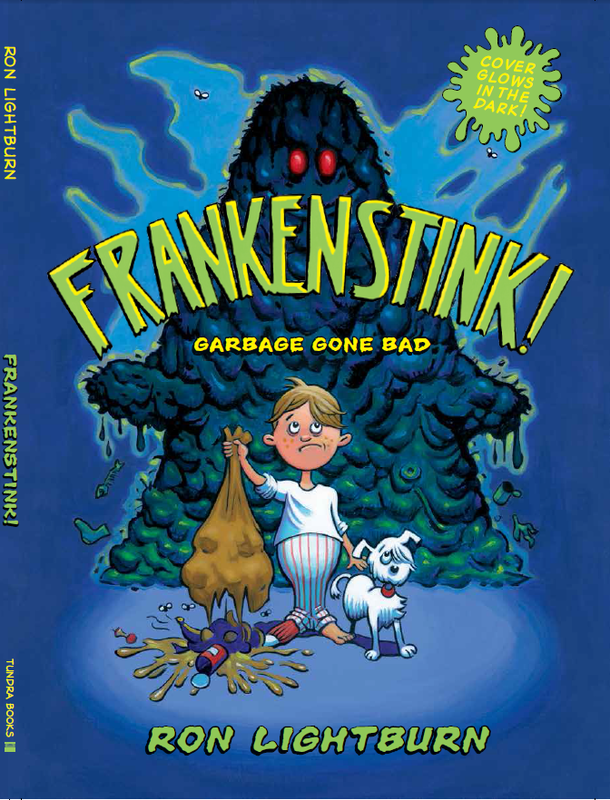 The advance copy of FRANKENSTINK! Garbage Gone Bad has arrived! 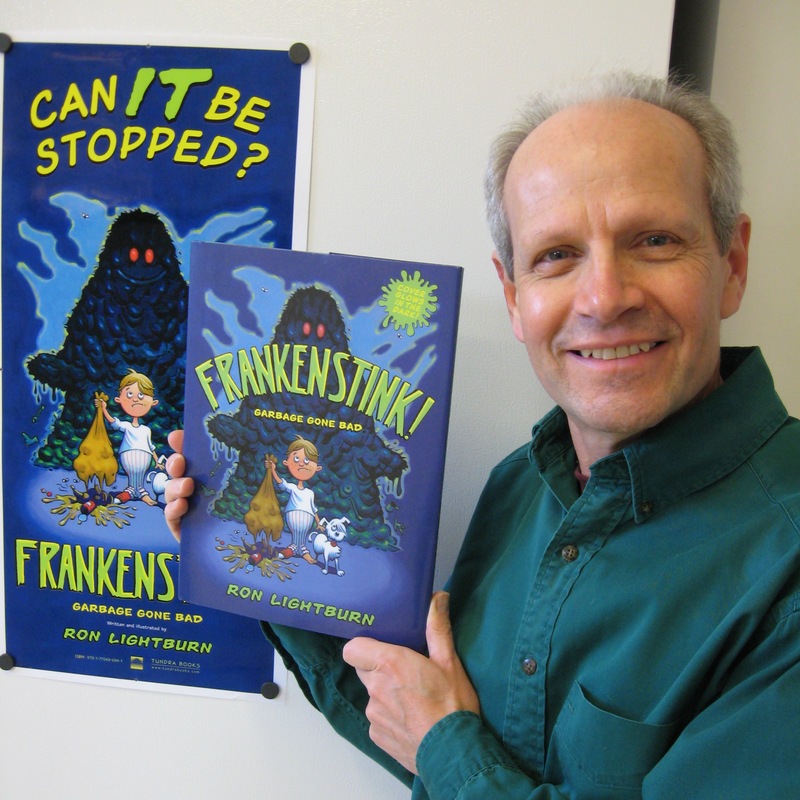 Ron with his advance copy of FRANKENSTINK! Garbage Gone Bad. 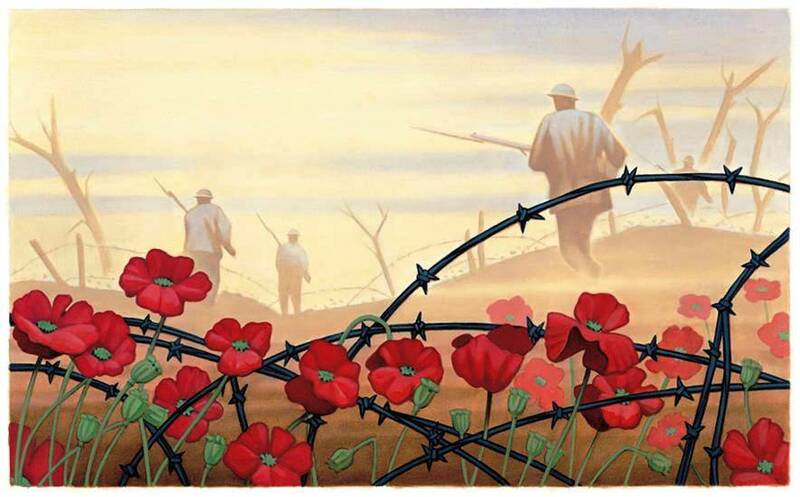 This is Ron’s first solo effort at illustrating and writing a picture book. He had a lot of fun using a comic book artwork style to tell the tale of a boy who ignores the growing pile of junk under his bed. FRANKENSTINK! Garbage Gone Bad offers a playful warning: change your ways or this junk may transform and mutate into a grotesque, greedy monster devouring everything in it’s path! and the cover of the book glows in the dark! Published by Tundra Books. Oozing into bookstores in March 2015, just in time for Earth Day! 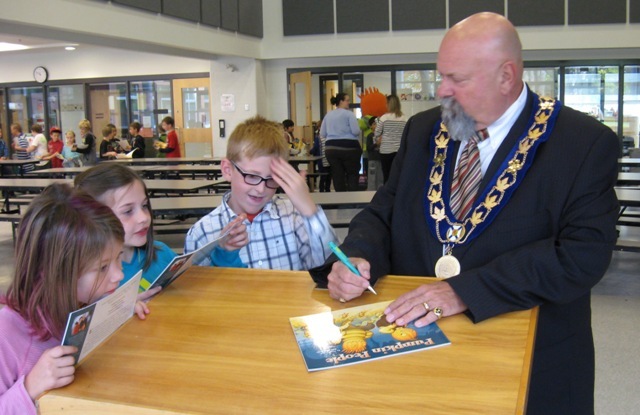 Kentville Mayor Dave Corkum gave his annual reading of Pumpkin People to the Grade 3 students of KCA (Kings County Academy). Great job, Mayor Dave! 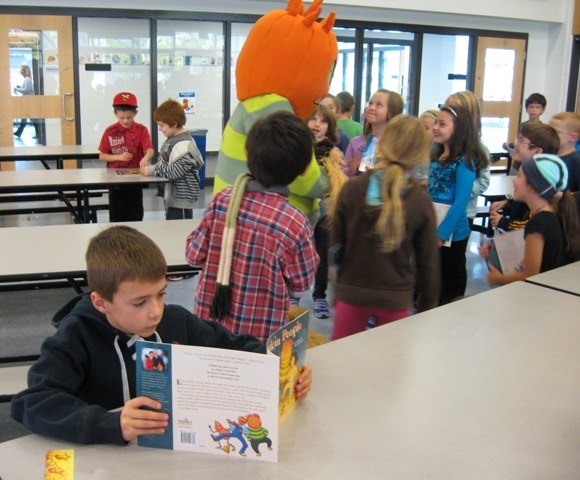 As part of this tradition, the Town of Kentville gave a free copy of the book to each Grade 3 student. 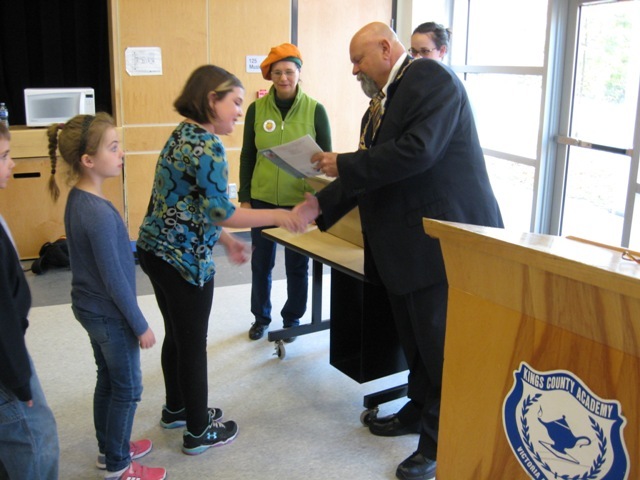 The town has generously donated copies to KCA students since 2008 to promote literacy and Kentville culture. 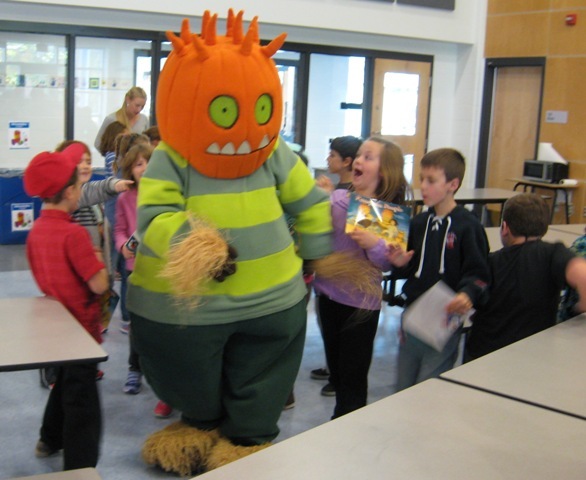 Spike the pumpkin person also joined in the fun! 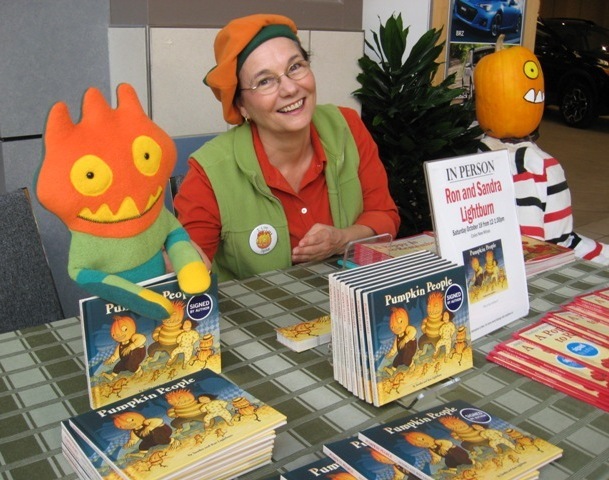 Mayor Corkum hands out copies of “Pumpkin People” to Grade 3 students while Sandra looks on. 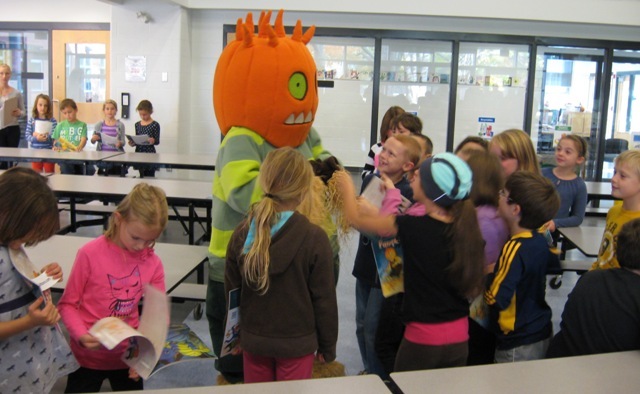 Spike is always a popular guy! 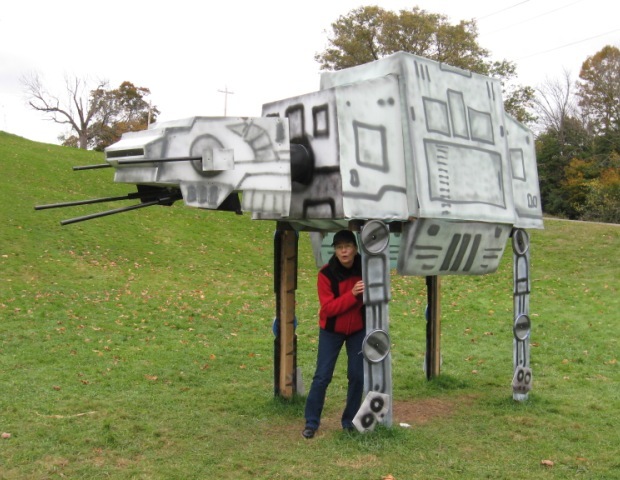 The theme for the 2014 Kentville Harvest Festival pumpkin people displays is movies from the 1980’s! 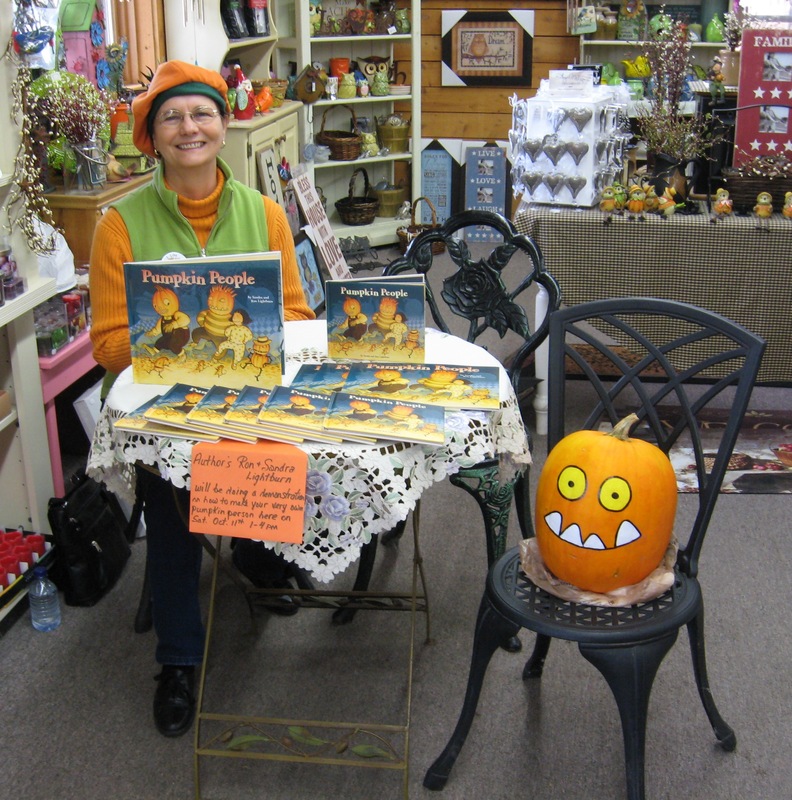 Our pumpkin pals helped out with our book signing at Coles in New Minas. Plus we had another great afternoon at Hennigar’s Farm Market. Busy afternoon at Hennigar’s Farm Market. 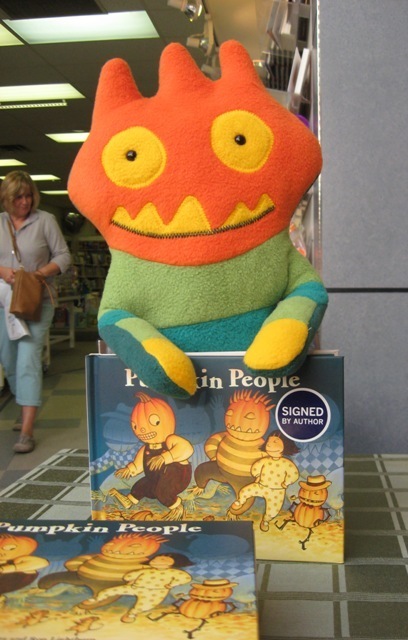 We signed & sold all their copies of Pumpkin People! Back next weekend? 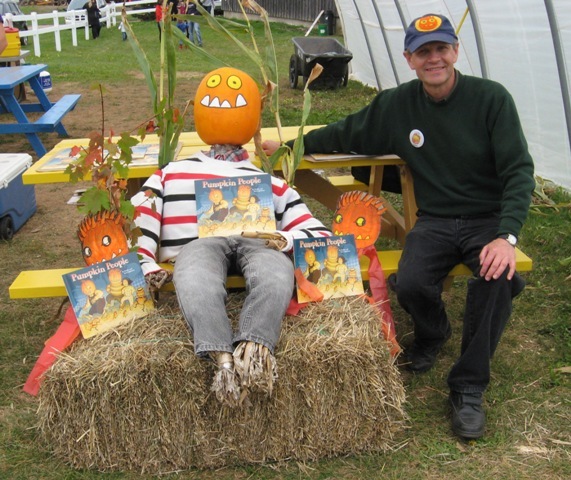 A StoryMob reading of our book Pumpkin People surprised the crowd at the Kentville Harvest Festival on October 4. 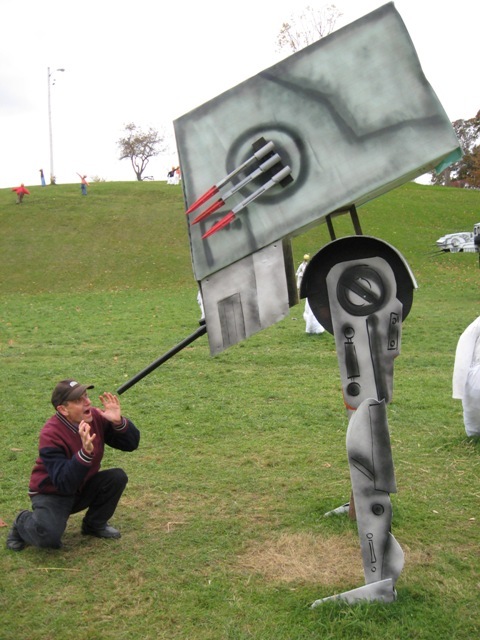 A fiddler played a lively tune while people in costumes waved props, danced and read a line or two from the story. What is a StoryMob? 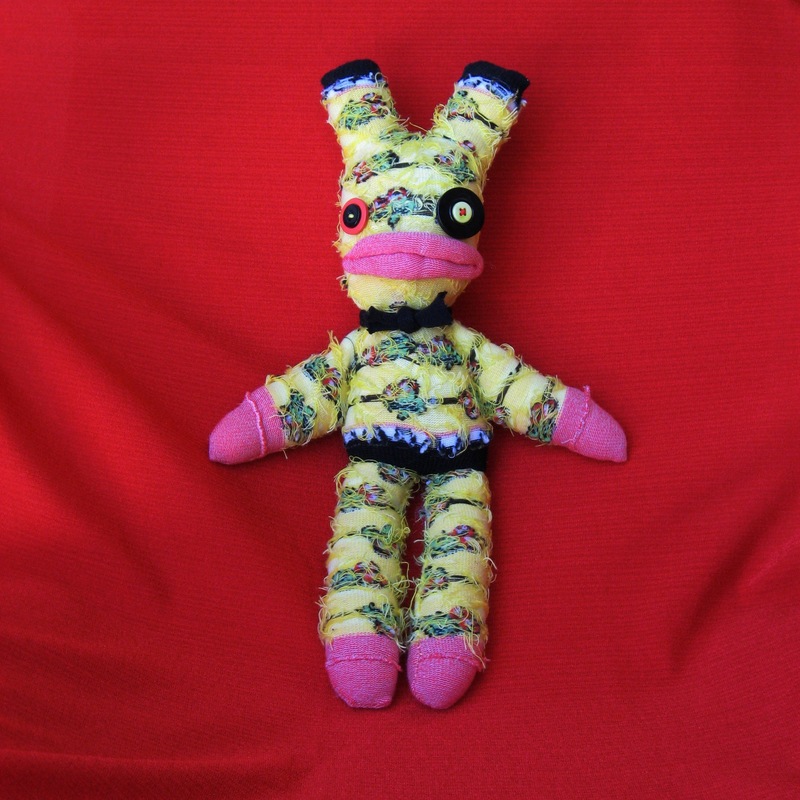 StoryMobs are where kids’ books meet flash mobs with a dash of Mardi Gras thrown in. 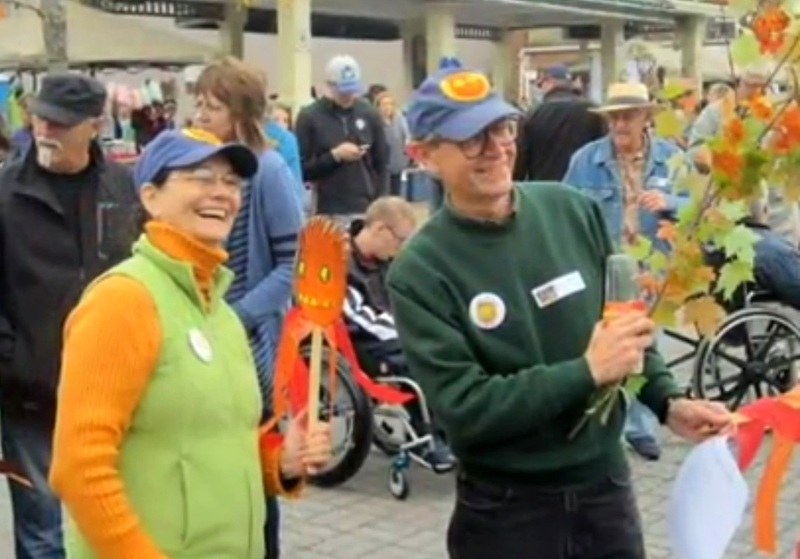 A story mob is inspired by a children’s book and allows for participation in a variety of ways. These may include costumes & props, copies of the book, simple choreography, musical instruments and vocal parts. 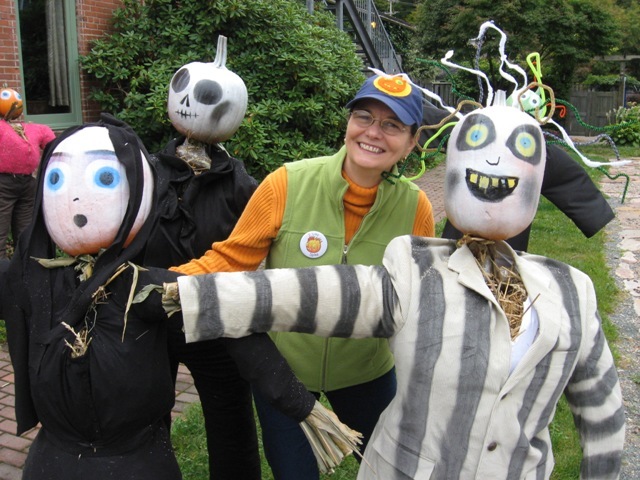 StoryMobs are primarily aimed at families, but warmly welcome the involvement of book-lovers, flash mob-enthusiasts and fun folks of all ages. StoryMobs is a free event. Like other flash mobs, StoryMobs appear out of nowhere in an apparently spontaneous way, in a busy public space, at a (quietly) designated time and then disperse without any additional fanfare after they have finished. 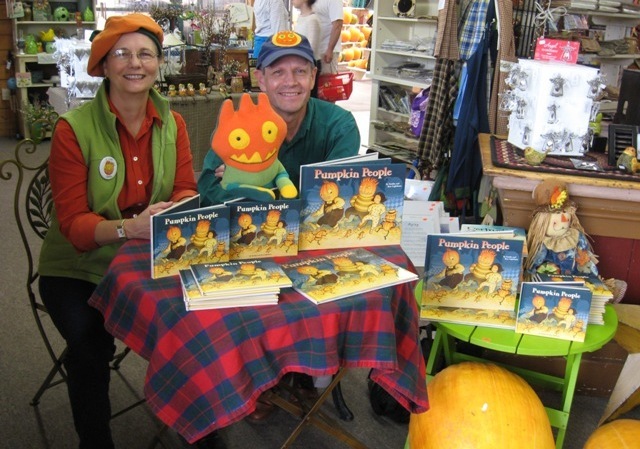 Here is a video of the Pumpkin People StoryMob using still photos taken during the event. Sandra and Ron get ready for the StoryMob. 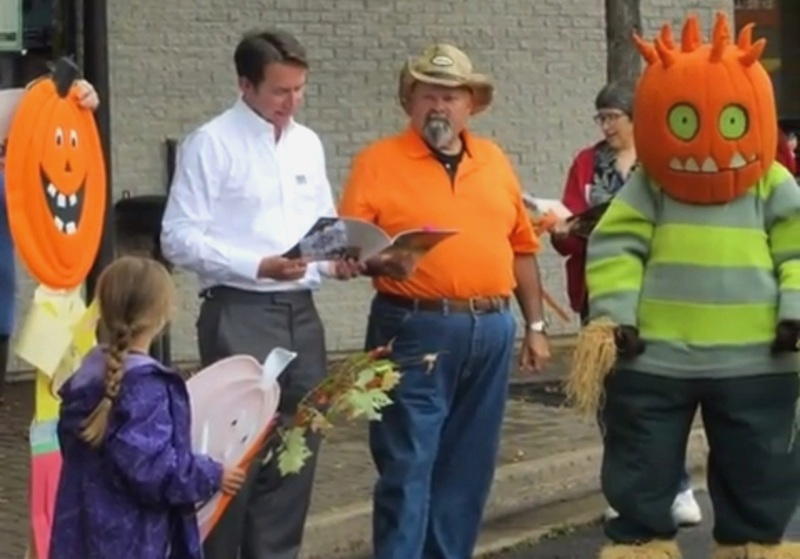 Scott Brison MP, Kentville Mayor Dave Corkum and Spike the pumpkin person perform at the StoryMob. 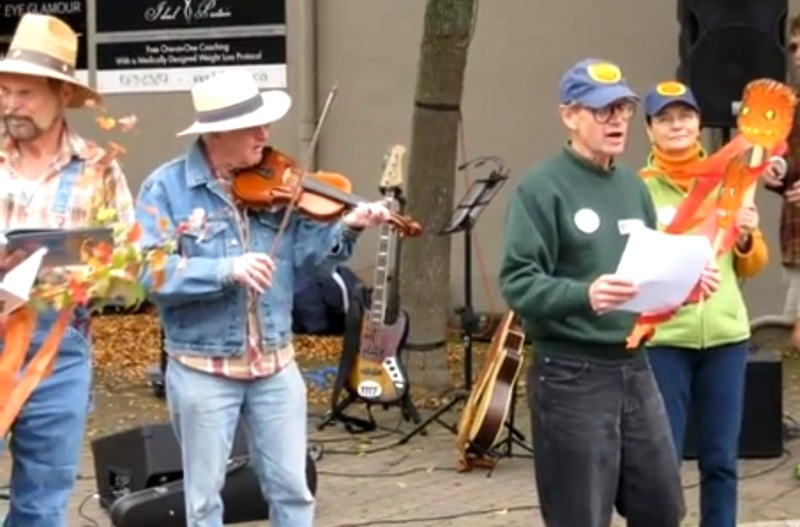 Fiddler Jack Kaulback plays while Ron reads. 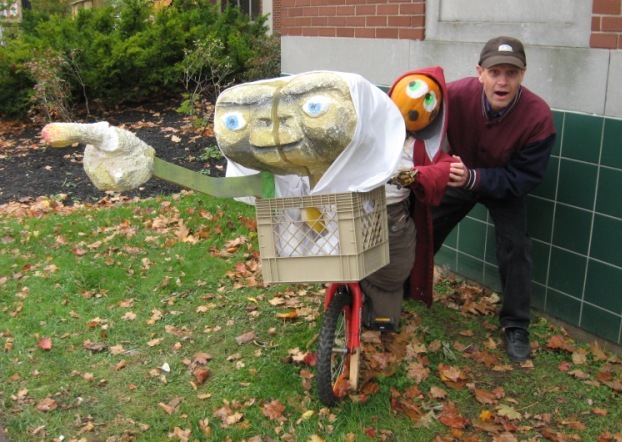 For the 2014 Kentville Harvest Festival the pumpkin people reappear as characters from 1980’s movies! Sandra mingles with the Beetlejuice gang. Ron would make a tasty treat for Audrey II from Little Shop of Horrors. 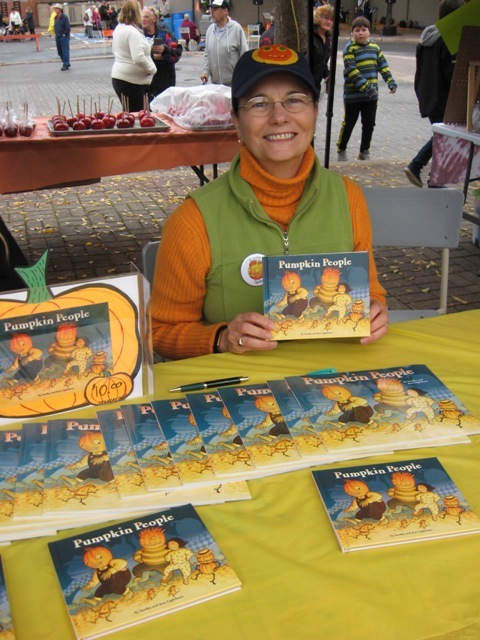 At the opening of the Harvest Festival in Kentville Town Square we introduced the new “mini” hardcover edition of Pumpkin People. Later in the day we shared a table with a good friend at Noggins Corner Farm Market. Harvest is coming and the pumpkins are almost ready. Wally is busy working on his Spike patch. 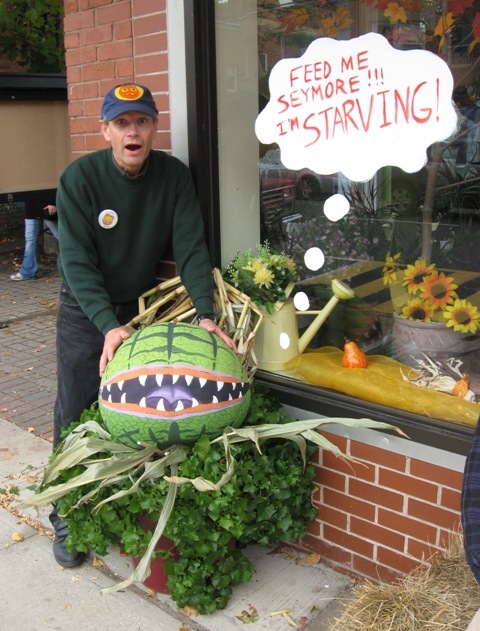 Wally is preparing for the Harvest Festival. Sock monkey teenagers get bored easily. So Eddie is going to Ottawa to play soccer and practice his banana kick. He is really excited about joining Team Q.
Eddie the teenage soccer nut. Hurrah! 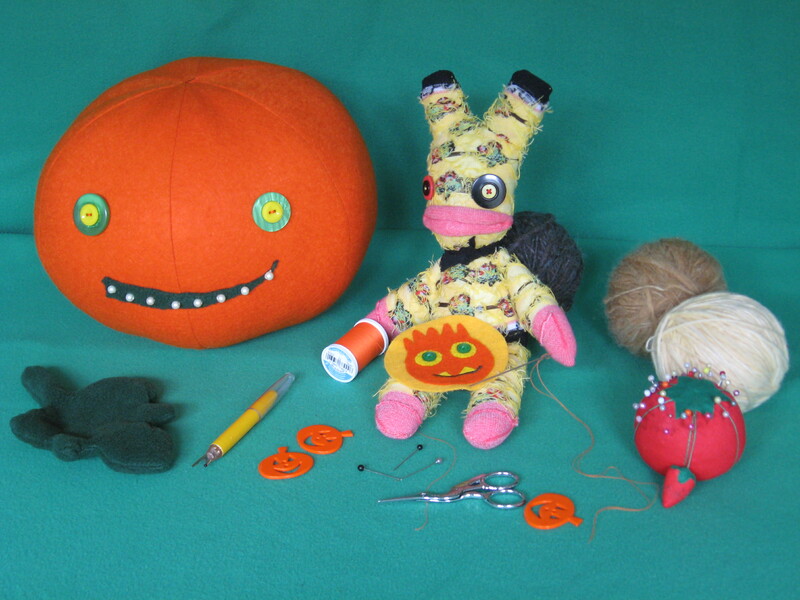 We will have a booth at the CK Gators Craft Fair on Saturday, October 25, 2014 from 10 am to 3 pm at Central Kings Rural High School. 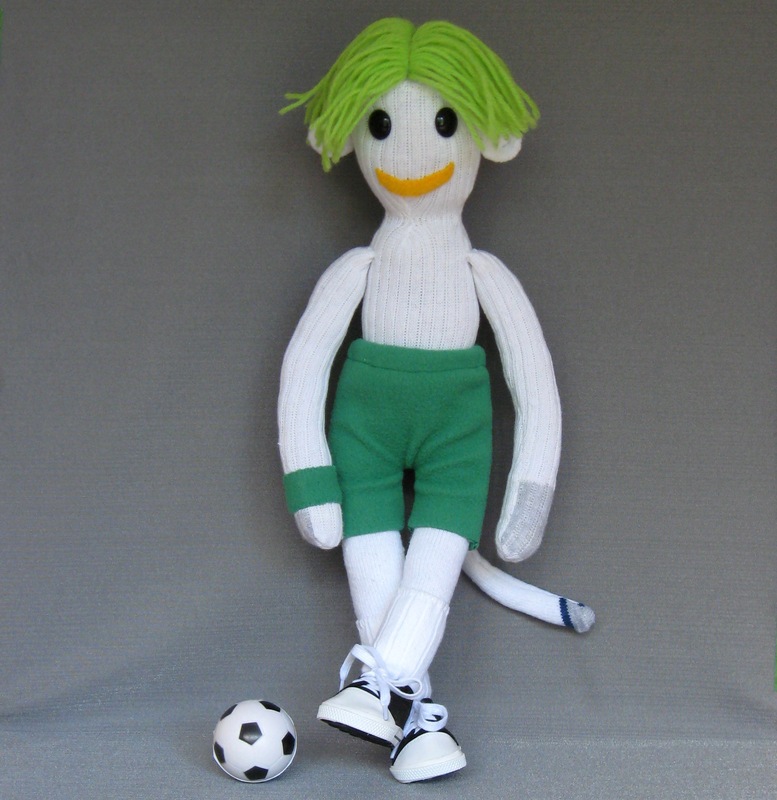 On sale at our booth will be non-traditional sock monkeys, sock dolls, sock creatures, garden glove dolls, books and more! Come on by for a chat and some giggles. Rocko is searching for a safe house to lay low so he can stay out of the slammer. Blanche and I had Ladies Afternoon “Out and About” today. 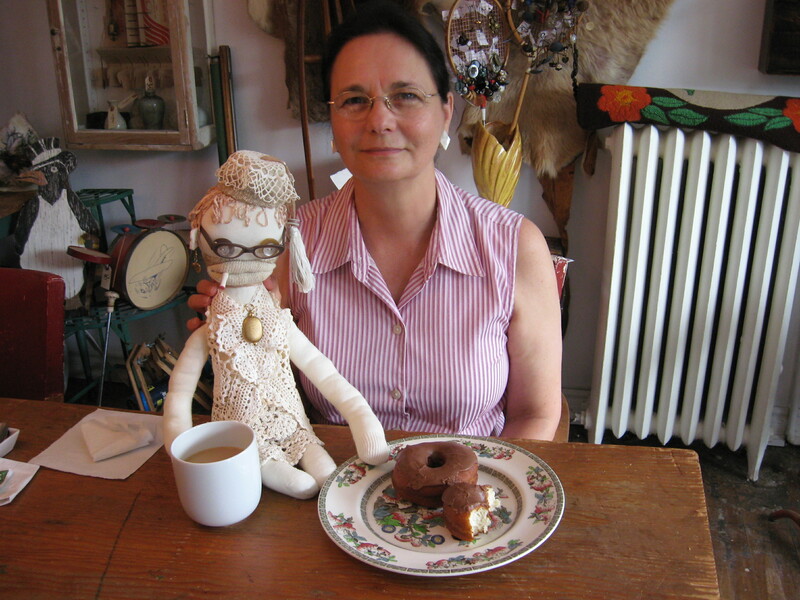 We decided to go to Wolfville and have a nice cuppa and a donut at Shiny Things Cafe. https://www.facebook.com/pages/Mortiscycle-Sideshow-food-truck-Shiny-Things-Cafe/584312674972625 Lisa makes the best donuts ever! 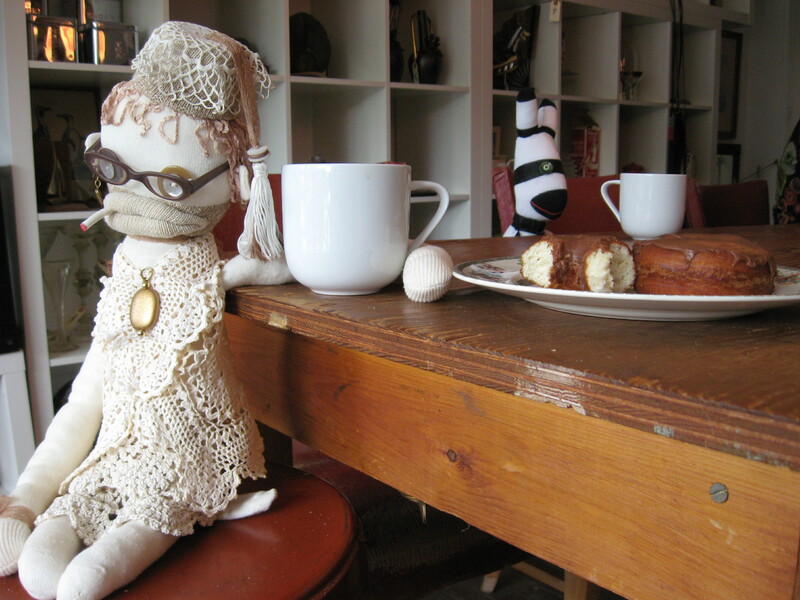 Blanche and I were enjoying our chocolate amaretto donuts and tea, but did not converse with the escaped convict who sat at our table. Everyone agrees – damn fine donuts! Thanks Lisa! Lucky for us, Hurricane Arthur only damaged one of our trees. Arthur broke some branches on our maple tree that we planted 16 years ago. Thank goodness we only lost power for one day…not like some people who were without power for a week! 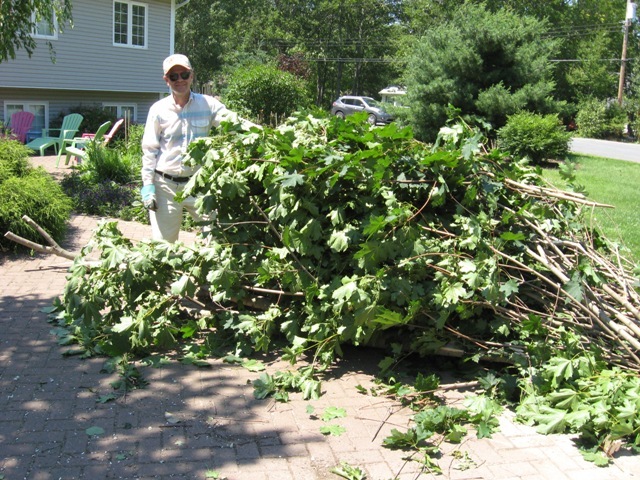 Our poor maple tree lost some branches thanks to Hurricane Arthur. And, of course, there was some cleaning up to do. 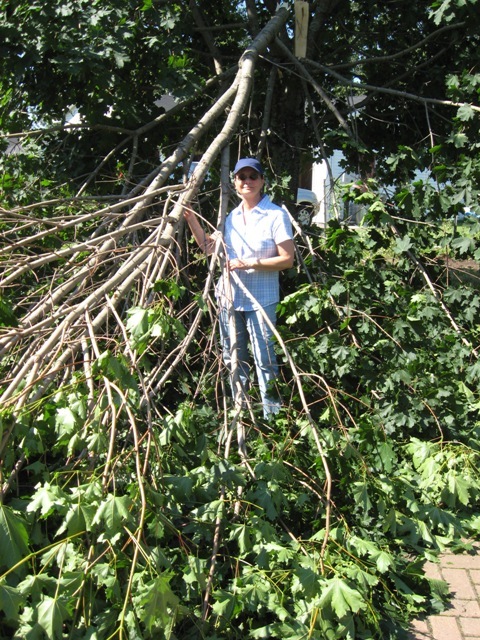 Ron gathering the branches and mess left by Hurricane Arthur. Oh No!! Hurricane Arthur hit Margo’s Place! Hurricane Arthur hits Margo’s Place! 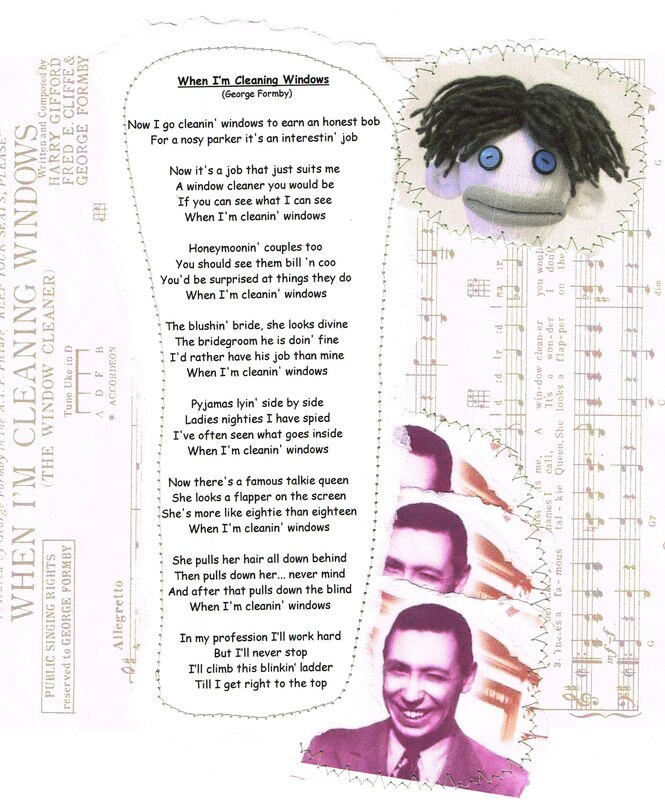 JAKE’S favourite song…”When I’m Cleaning Windows”. What’s your favourite George Formby song? What a morning! I have to admit that I was not fully awake as I wandered back stage at Margo’s Place, tripped over a ladder and upset a bucket of dirty water. Unfortunately, Jake was up the ladder and as he tumbled down he just missed landing in the wet, dirty mess. He got up, dusted himself off and suggested that I should have a few more cups of tea before I go stumbling around and knocking things about. 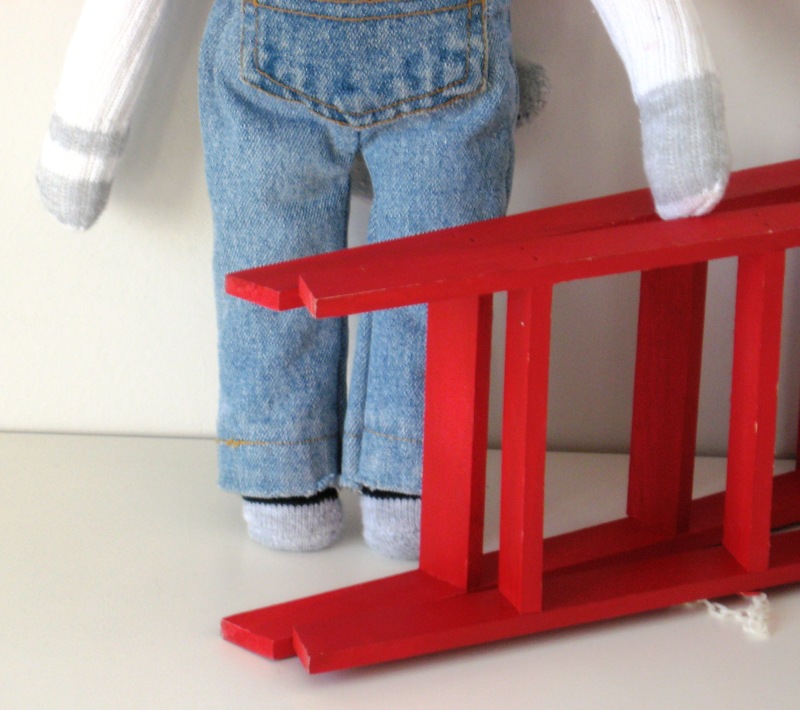 He righted the ladder and said that I had to clean up his window cleaning water that had spilled all over the floor. But since Jake is really an old softie at heart, he said he would entertain me while I mopped up. He climbed his ladder, got himself all comfy at the top and sang for me his favourite George Formby song, “When I’m Cleaning Windows”. 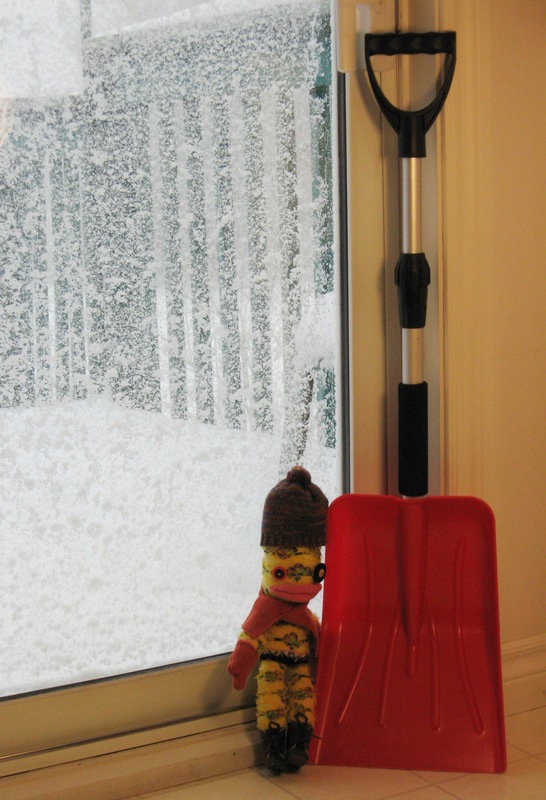 Wally volunteered for snow shoveling duty. A little guy with big ideas and an even bigger shovel. Well, there seems to be a lot of activity going on at Margo’s Place today. Workmen are taking all of the tables and chairs to the basement and I hear sawing, hammering and cursing coming from down there. I tried to ask Wally what was going on as he raced by me with a huge armload of costumes. He kept going and called back over his shoulder that he was sorry but he couldn’t stop to chat. He looked a bit frazzled. 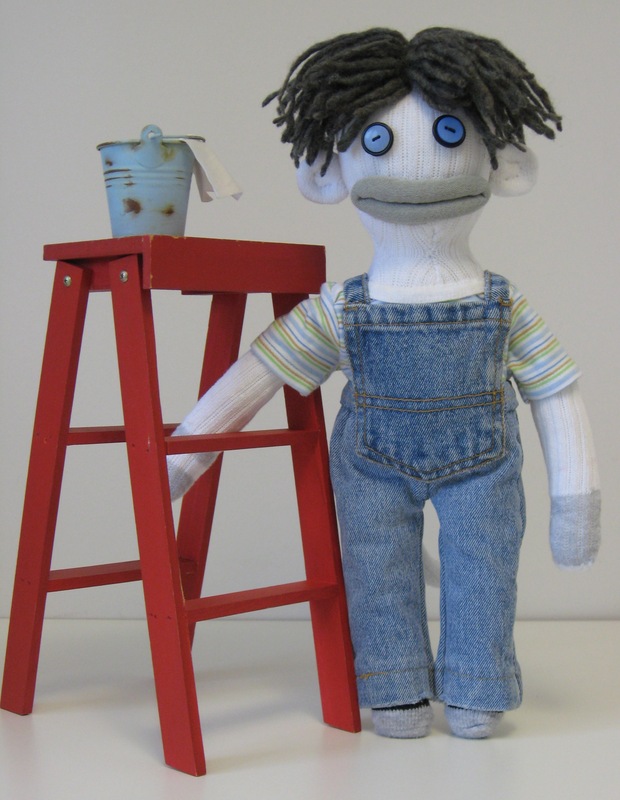 I spied Jake the Window Cleaner and All Round Handyman with his ladder heading for the basement stairs. I ran up and asked him what the heck was going on. He stopped and gave me a pitying look, “Don’t you listen to weather forecasts? There’s a storm coming tonight and they predict that we will get 30 – 40 cm (11 – 15 inches) of snow and howling winds up to 100 kilometers and hour (60 mph).” He put down his ladder, leaned forward and whispered in my ear, “Margo’s a wee bit jittery today, she afraid the storm may be Son of Hurricane Hooligan. So we’re building a temporary stage and dressing rooms downstairs and moving all the tables and chairs down there too. Margo doesn’t want her club to be blown away again.” He straightened up and said, “Make yourself useful and carry that box of candles downstairs.” And so I am caught up in all the preparations. Fasten your seat belts; it’s going to be a bumpy night! 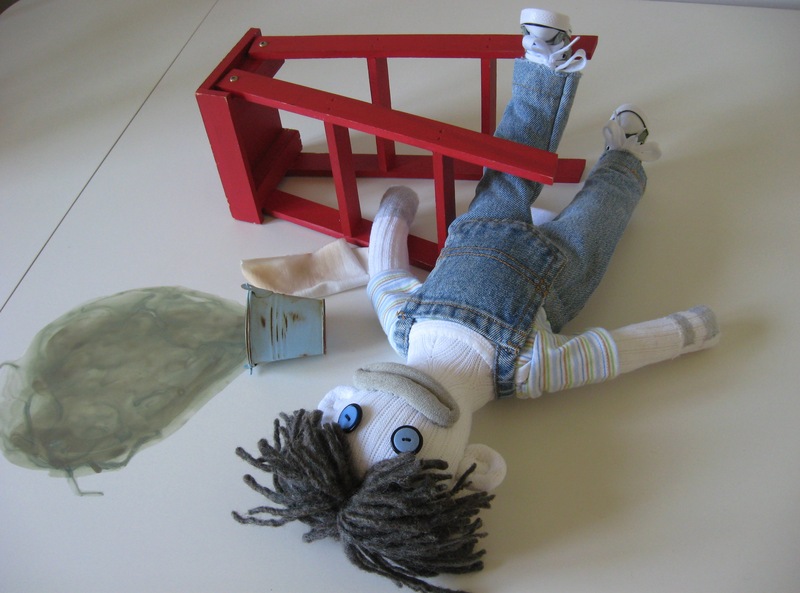 I was partying at Margo’s Place the other night and asked Wally to pose for a photo. He is the busboy at Margo’s and also “dresser to the stars”. With so many divas starring on stage at Margo’s Place, Wally is kept extremely busy and sometime his nerves get a bit frayed. 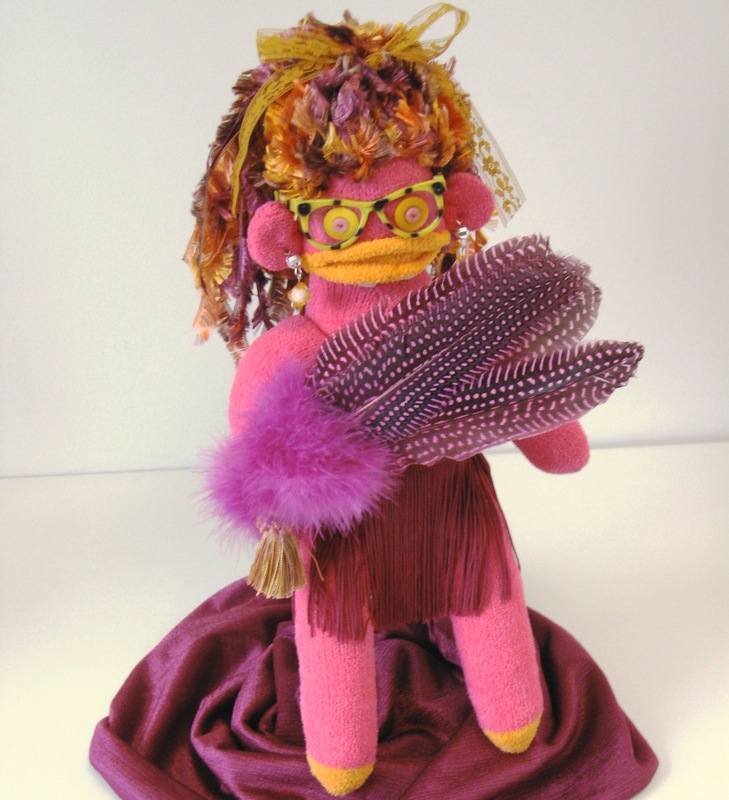 Margo’s Place is proud to present Nixie the Nearsighted Fan Dancer. 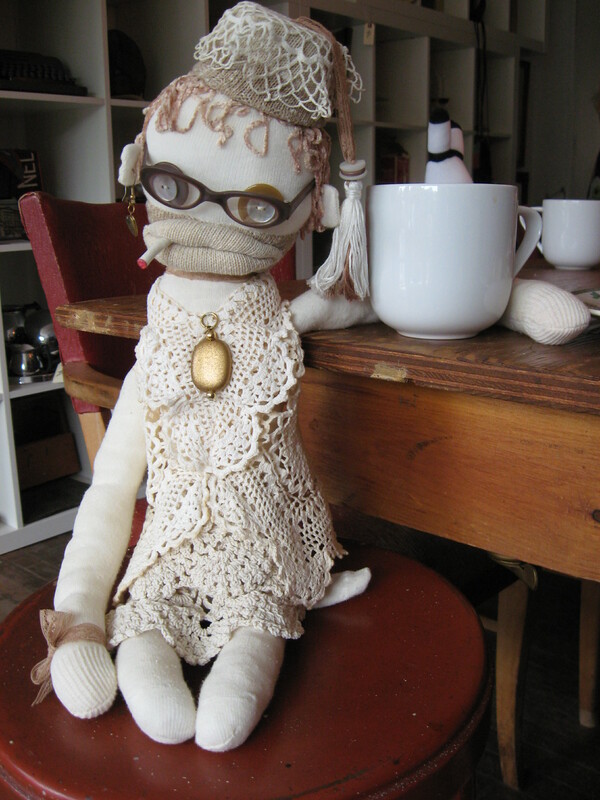 Margo’s Place is proud to present, live on stage, Nixie the Nearsighted Fan Dancer! Featured in two shows nightly, Nixie is headlining the “Follies Mar-Go Revue” in the International Ballroom.